If you really need to keep your MJ number and GV won't port it I have heard of others first porting their land line number to a throw away cell phone and then port from the throw away to GV. Thanks for the great advice. It wouldn't be an issue if the wife and family hadn't beaten me half to death already over changing our home number a few times. I don't know how much more I can take...lol. I may just just play with the Obi110 with GV and later forward my MJ number if it works out well. Porting the home number to a PAYG cell and then to GV sounds like a viable option. The only irritation so far would be that I can't disable or change the ring count for the GV voice mail so my answering machine can pick up the calls. MJ (as do a lot of other VOIP providers) has the same restriction for some reason. Obviously each set-up is different, but for what it's worth, as long as my power stays on, I bypass both the GV and MJ voicemail systems. I have my MJ output plugged into a wall phone outlet which has the MJ ring on 3 phones, including the one with the answering machine. It also works plugged directly into the phone with the answering machine but I don't keep that in the computer room. Obviously each set-up is different, but for what it's worth, as long as my power stays on, I bypass both the GV and MJ voicemail systems. My integrated answering machine has two settings 2 & 4 rings. Three rings is optimal for us to get around to consistently answering the phone. I wish that I could set MJ to 5 rings or disable it all together. When I call my GV number on my standalone OBi GV doesn't transfer to VM until ring 5. You could always buy MagicRingforever a program which I use to set the number of rings to what ever I like. It costs $10.00 and is well worth it. At least to me anyways. You can get it from pcpphonesoft.com. You could always buy MagicRingforever a program which I use to set the number of rings to what ever I like. I tried that program (which is free incidentally) and is was giving me all kinds of grief. I also considered Magicfeatures but that app uses double half-time rings instead of one standard ring which I don't think changes the time span, just the number or rings. So 3 Magicfeatures rings would be the same 1-1/2 standard rings which is too short for me. I tried that program (which is free incidentally) I tried that program (which is free incidentally) and is was giving me all kinds of grief. I also considered Magicfeatures but that app uses double half-time rings instead of one standard ring which I don't think changes the time span, just the number or rings. So 3 Magicfeatures rings would be the same 1-1/2 standard rings which is too short for me. It may have been at one time. It has been $9.95 for a while from my visits to the site. And for what it's worth, I use MF and use the double ring feature and my answering machine kicks in after 3 (or maybe 4, not usually there when it goes to the machine) double rings, which takes the exact same length of time as the 3 (or 4) standard rings without it. Edit: They do have a free trial on all their products. which takes the exact same length of time as the 3 (or 4) standard rings without it. Thanks for the info nailguner. I guess the only concern I may have left is how well the MF will work on my Thin Client with its limited resources. I might give it a try after my vacation. I'm still thinking quite seriously of playing around with either Obi110 or Asterisk and using voip.ms or something. I guess the only concern I may have left is how well the MF will work on my Thin Client with its limited resources. I might give it a try after my vacation. You should try the magicringforever not the MF. I use the magicjackringforever on my thin client and if I turn off my answering machine my phone keeps ringing until I answer it. Here is something posted from the pcpphonesoft forum below. In regards to the thin client setups where computer resources are minimal and leaving the MJ dialer open on the screen is not typically a concern, disabling the "Automatically Minimize Dialer on Hangup" option may buy you an additional second or so as the MJ dialer does not need to re-open itself on further incoming calls. If you want the phone to ring more frequently to get your attention, you can enable the "Double Ringing" feature. 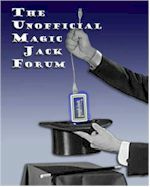 The only working solution we are aware of that seriously gives you longer to answer the phone is the MagicRingForever Plugin. I use MF and use the double ring feature and my answering machine kicks in after 3 (or maybe 4, not usually there when it goes to the machine) double rings, which takes the exact same length of time as the 3 (or 4) standard rings without it. ::: Ringing is done in 3 second intervals instead of the standard 6 second intervals. Your phone will physically ring 7-8 times instead of 3-4 times before routing to voice mail to facilitate the use of external answering machines. This feature does not increase the voice mail timeout timer. For Selective Call Answering Machine Pickup use the Priority Call Ringing feature. Is yours working differently than this? Thanks Thunder, I haven't tried the MRF on my thin client but it was giving me a lot of grief on my desktop PC because we use multiple desktops one for the wife, and one for me. I could also never get it to start up again reliably after a reboot. Kind of? I just did some test calls with and without the double-ring enabled. With it on, I'm getting 3 full double or 6 single rings, so I'm not getting the 7-8 rings they mention. With it turned off I'm getting 1 quick and 3 long rings. With it enabled, the answering machine is picking up. But what surprised me is that with it off, it's going to the MagicJack voice-mail. I installed MF at the same time I plugged my MJ into the house to ring on the answering machine phone. So now I'm assuming it was doing that from the start and I didn't notice since I've had double-ring enabled on MF since I installed it. On 4 test calls, 2 on each setting, from the time the phone rang in the house, until it got picked up by a voice-mail was either 17 or 18 seconds on all 4 tests. The PC PhoneSoft web-site says it should be going to voice mail at around 24 seconds, and with the almost 3 second lag I had from the first ring on the cell to the first ring at the house, I'm sort of close. Regardless, I was not subjected to a 1 1/2 ring pick-up as you were concerned about.